Yesterday, I decided to take the campus shuttle to work instead of biking in - I wanted to test and see how accurate the time was on the schedule for Thursday, when I'll need to ride it to work again (not bringing my bike so I can call for a cab and go directly to the airport after class!). Since I wanted to bike home, though, I brought my bike and hitched it up to the bus' bike rack, then took my seat. The bus ride was 45 minutes from my apartment complex to the school's library - a good 20 minutes longer than it takes me to bike there, something I was a little proud of. I unloaded my bike and walked it from the library to the building where my office is. 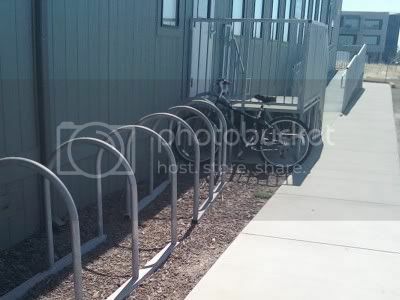 As I got to the bike rack, I noticed something was missing: my bike lock. I checked the bag where I put the helmet and my Garmin - nothing. I checked my purse - nope. Then I realized what I must have done: I usually loop the lock around the handlebars while I ride. Not a problem while my hand is next to it, keeping it on. But somewhere between my apartment and the school, it must have fallen off and rolled to the side of the road. After wheeling my bike down the office hallway and cramming it into the corner of an office already crowded by the four of us who share it, I sat at my desk, exasperated. I feel stupid. Reaching into my bag, I pulled out my breakfast: a banana and a container of Yoplait Light. The morning was not off to a good start, but breakfast is the most important meal, and I hoped it would help me refocus on positives for the rest of the day. But ... I usually eat breakfast before biking in. Grabbing everything in a rush to catch the bus, I didn't think to grab a spoon, too. And I felt stupid. Most of the beginning of my day was like that, to tell the truth. I sort of knew it was going to be bad when I stepped on the scale in the morning and saw an extremely high number. It wasn't surprising, considering how much I had eaten the night before - I bargained with myself in the grocery store, saying I could handle what I was buying. You need to be able to handle it. You need to control yourself. I wish I could make a sandwich for lunch, really. But I'm just not strong enough right now for certain foods, I suppose. Waking up, seeing numbers I never wanted to see again ... that set the whole rest of my day on a negative path. Because I felt stupid. Weight loss is a math problem. Calories in, calories out. You can do this. You did this so well for a while. And now you can't do it. You can't stop eating. You can't control yourself. You're stupid. I'm not sure what intelligence has to do with too much snacking, but "stupid" is my go-to self-inflicted put down. It's the one that really hurts. I've always heard fat and ugly and for the most part, I've let them roll off my back. I was okay being the fat girl, the ugly girl, the whatever girl - because underneath it all, I was a smart girl. I was the academic. Despite my body's failures, I was successful in this one arena. So to be called stupid means to attack the one consistent strength I've always believed myself to have. I am a million things right now. I am a sister. I am a daughter. I am a long distance lady friend. I am a new faculty member at my university. I am a new neighbor in my community. I am lonely. I am dizzy. I am frustrated. I am losing sight of my goals. I am regaining weight. But - I. Am. Not. Stupid. I am distracted, and I am not at my best. But I'm strong, and I'm aware, and I'm capable of getting back on track and refocusing. Of getting things moving again in the right direction. Of finding my vision again. And I fell asleep after a long, hot, frustrating, perfectly on-plan day believing myself to be a truly smart girl. I hate that word!! I heard it the first time when I was 4 years old, when my dad called me stupid because I was afraid after we had been rear ended in the car. I was 4...the word changed my life in a negative way and it took years and years for me to realize that I was not stupid. You my friend are far from stupid!! So glad your day ended on a positive note! Take care of yourself and stay focused on your plan!! Don't underestimate yourself. You may be going through a bad spot right now (which is perfectly understandable - you just moved to a new place, leaving everything familiar behind), but you'll get through it. You are sooo right. You are not stupid, just distracted... <3 I've been feeling the same lately so that's good to hear its not just me! I always notice that you put your food diary up on twitter - I'm sure as it's a accountability thing. You've said a lot of your downfall has been night snacking (mine too) - maybe you should start entering in your food diary before bed! or in the mornings from the night before. It might help you! You are definitely not stupid or ugly my dear - and I hope you spend time telling yourself of this over the next while until it's instilled in you for good! You are going to get back there Mary. Don't be so harsh with yourself! You are a smart girl!!! You are not stupid, not by ANY stretch of the imagination. Look how far you've come! You definitely didn't get to this point by being stupid. You got here by being smart and by being strong. You're strong and I know you will get right back where you want to be. Of course, you're not stupid. Distracted is a much better word. You know what you need to do, Mary, and you will get back on track - I know it! I have a three year old and I don't allow him to say the word stupid. I told him we don't say that word because it's not nice. He heard a cartoon say it on tv the other day and he told me about it and how we aren't supposed to say that. I was very proud of him. I didn't realize how much I said the word stupid until I started telling my son he couldn't say that word. It is a very negative word and I'm glad you turned your day around and remembered that you are in NO way stupid. Sometimes we make stupid choices, but that doesn't mean we are stupid. Hang in there!! Do what you need to do and you will see the results. You obviously got to where you are in your life because you ARE SMART. Don't forget how far you've come. Stupid is the one evil word for me too...I always knew I was smart and could work hard, and for some reason to me that word hurts more than fat or ugly...even now. I am pretty sure a stupid person does not recognize when they do "stupid". I am glad you have recognized that the name calling has to go. It is rude. I HATE that word. It is the one word that always cuts me to the bone too. You are most definitely NOT stupid. We all have off days.... or off weeks... or just bits where we fall in a rut. It happens, we pick ourselves up and we start again with fresh focus. Don't let one rushed day get to you. Lol believe it or not there is some woman living in Bakersfield, Ca that has the word "Stoopid" tattoo'd to her forehead. I think it was a bet. I saw her and thought...how stoopid, lol. I love this post and will think of it when I am thinking of doing something off plan. Thanks!